Any time a band starts to get big, it's fascinating to see how their stage show translates from small venues to much larger ones. 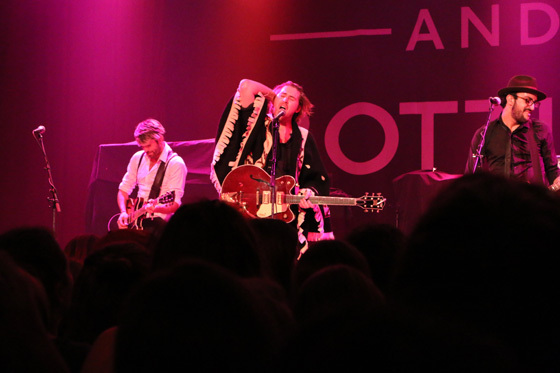 The last two non-Lollapalooza shows Catfish and the Bottlemen played in Chicago, for example, were at Schubas and Subterranean--the latter of which I attended, and which had that delightfully claustrophobic feel Subterranean always gives you because of the overhanging side balconies. Catfish came at that show like it was a raucous house party, impressing me enough that I went to see them at the far more spacious House of Blues last night. But instead of the venue changing the band, the band changed the venue. 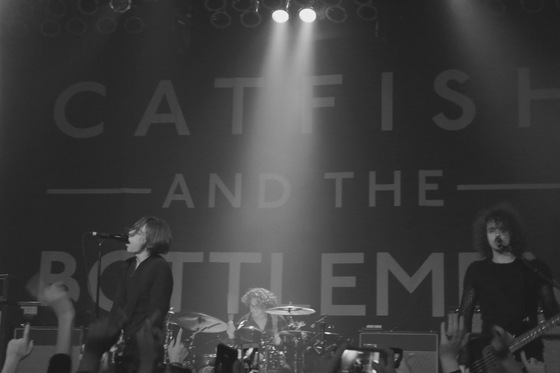 The concert felt like a basement gig--a steamy, sweaty, throbbing mass of high school basement gig--and that's an indication of the transformative power of Catfish and the Bottlemen's music. I had never really thought about what type of audience the band would attract, but it turned out to be very young (average age was probably 18, notwithstanding parents there with their adolescents) and very female. When a girl behind me lamented that she probably couldn't come to the Smallpools show in two weeks because it was the day of her ACT, I felt old at a concert for the first time in my life. Fortunately, though, I wasn't the only old soul in the house. Opener Jamie N Commons took the stage with a Man With No Name-type rug over his shoulders and a raspy blues voice that carried the weight of decades he himself hadn't experienced (he'll be 27 this month). Though he hails from Britain, he told the crowd that he'd spent six years of his childhood in Chicago's north suburbs, and that playing here was a return to his roots. 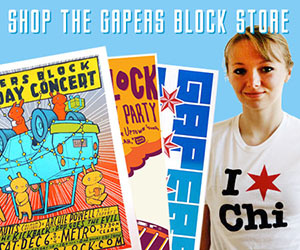 To celebrate, he threw a taste of "Sweet Home Chicago" into his set. His performance was one of the best opening acts I've ever seen. The music fell solidly within the realm of the southern-inspired blues rock that emanates from every honky-tonk bar in Nashville, with guitar leads that smacked of Kenny Wayne Shepherd in his prime and a driving, bass-heavy rhythm section. Above it all Jamie, whose contagious smile never left his face, sang with a soulfulness that came through equally well on love songs like "Caroline" and "Is Your Love Still Strong" and on darker tunes like "Lead Me Home," a song featured in The Walking Dead that he played solo on acoustic guitar to begin the set. The crowd seemed a little subdued at first (almost as if they weren't expecting an opener), but Jamie had won them over after about ten minutes. When he and his band finished with the standout "Jungle," recorded originally with X Ambassadors but last night played as a badass blues rocker, the wooden floor bounced like a trampoline as the entire audience grooved to the beat. After the requisite break that felt like forever and the audience shuffling that always happens between acts, the lights dimmed and the screaming hordes rushed forth like a tsunami--who needs personal space at a concert anyways? The Beatles' "Helter Skelter" blasted over the PA and I sang along, but everyone joined my excitement when Catfish and the Bottlemen took the stage with a rollicking intro jam that led into "Rango." 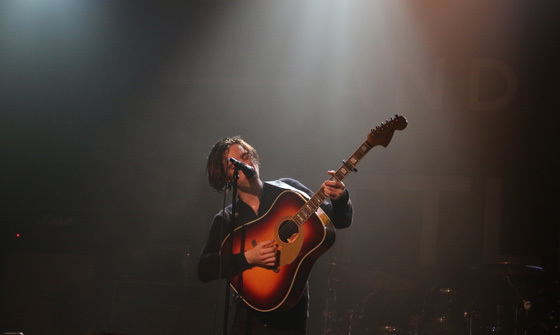 I think the band's four members were wearing exactly the same black outfits as they had been at Subterranean, with singer Van McCann rocking a zipped-up sweater that had to contribute heavily to the sweat pouring down his face and coating his hair. From the first chorus of "Rango," for which he held the microphone out over the audience as everyone sang for him, he demonstrated an expert ability to read the crowd and get it invested in the show. McCann alternately embodied the thrilled Welsh lad ecstatic at the band's reception and the brooding writer of Catfish's gritty, often angsty songs, playing his guitar with a head-down ferocity and attacking the microphone like a fanatic but then cheerily thanking the crowd at every possible moment. At one point during "Fallout," he kicked a beach ball that had landed on the stage to wild cheers. And towards the end of "26," he knocked over his mic stand in a move that earned him oodles of punk cred, particularly when he picked up the standless mic, howled the song's chorus into it, and then held it to his guitar as he thrashed the strings. McCann's magnetism was such that when he was illuminated by a single white light, as he was during part of "Business" and for the entirety of the acoustic "Hourglass," he held the audience's rapt attention and wordlessly commanded their vocal participation like some sort of garage pop messiah. McCann's raw vocals were backed by a pristinely polished rhythm section--bassist Benji Blakeway and drummer Bob Hall were in lockstep all night and even got to flash their soloing chops during a breakdown on "Business--and the brilliant guitar work of Johnny "Bondy" Bond, who channeled all his energy into his playing and barely moved or showed emotion all night. "Kathleen" was the highlight of the set, just over two minutes of pure power pop bliss that had the crowd singing along so loudly that McCann was barely audible. "Homesick," on the other hand, sounded a little muddy with reverb, and the slowed-down final repetition of the chorus led by McCann seemed manufactured. But I may only have felt that way because when I saw the band at Subterranean, their equipment malfunctioned during the song and the crowd sang the chorus unprompted, creating one of those magical moments that can never be recaptured. Honestly, given Blakeway's comments when I interviewed him last week, I expected the crowd's applause after "Cocoon" to last longer than it actually did. But it seems they were saving up to go bananas for "Tyrants," the band's final song of the evening as well as of their debut album The Balcony, which they played in its entirety (albeit out of track order). McCann beautifully raised the energy in the room over the course of the miniature epic, shrieking into the microphone during a Blakeway and Hall-led breakdown, then letting his guitar ring out in the darkness to a hurricane of cheers before he and the band launched into the song's soaring finish. 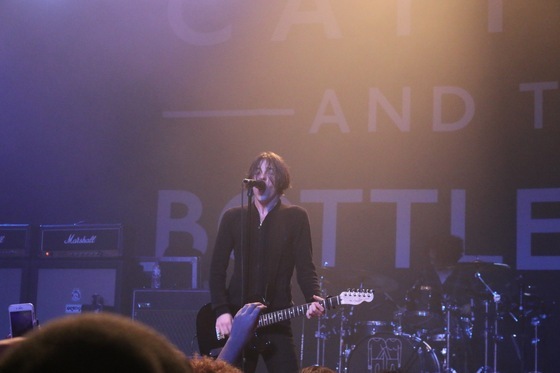 In my conversation with Blakeway, we discussed whether or not playing to larger crowds would change Catfish and the Bottlemen's aesthetic, whether the band would lose that bursting underground energy that fit small venues so well. 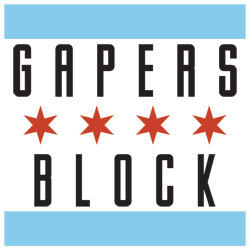 Now that I've seen them rock House of Blues the same way they rocked Subterranean, I have no doubt that they could make a stadium feel like a garage.